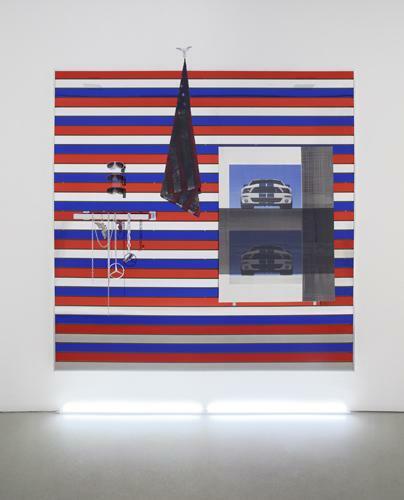 Josephine Meckseper, Cobra, 2011, sunglasses, acrylic fixture, metal chains, emblems, and belt buckles on metal fixtures, acrylic on flag, brass emblem, mixed media, and plastic on canvas on colored acrylic mirrored MDF slatwall, 96 x 96 x 22 1/2”. In her latest exhibition, Josephine Meckseper presents sculptures that further the themes raised by her previous shiny and seductive works that are also smart and interrogative of commodity culture. Take, for example, Thank a Vet, 2008, which includes objects such as a walker, mannequin legs, an underwear box, a T-shirt (telling us to “Thank a Vet”), and a plastic motor oil container, all of which are precisely assembled on a large mirrored plinth. Installed in front of a window with an expansive view of the city beyond, Thank a Vet reflects directly on urban life. Meckseper’s work elicits both anxiety and delight through slick aesthetics that reveal some of the power dynamics underlying the retail-driven icons of our age. The T-shirt has an American flag motif, and the reference to American veterans and the oil container imply a relationship to the gulf wars. In Cobra, 2011, mirrored red, white, and blue bargain store slatwalls are used to erect an American flag that is painted black, complete with a plastic silver eagle at the top of the flagpole. Juxtaposed next to this are three identical pairs of cheap aviator sunglasses, one red, one white, and one blue and an image on stretched canvas of two identical Cobra cars enclosed in stretch wrap and propped up by two brackets. Displayed together, the objects in the show create a biting critique of American consumerism. Perhaps in ways similar to Haim Steinbach, yet with greater ambivalence, Meckseper engages the viewer through tropes of titillation and desire, but a sense of unease ultimately ties her works together.